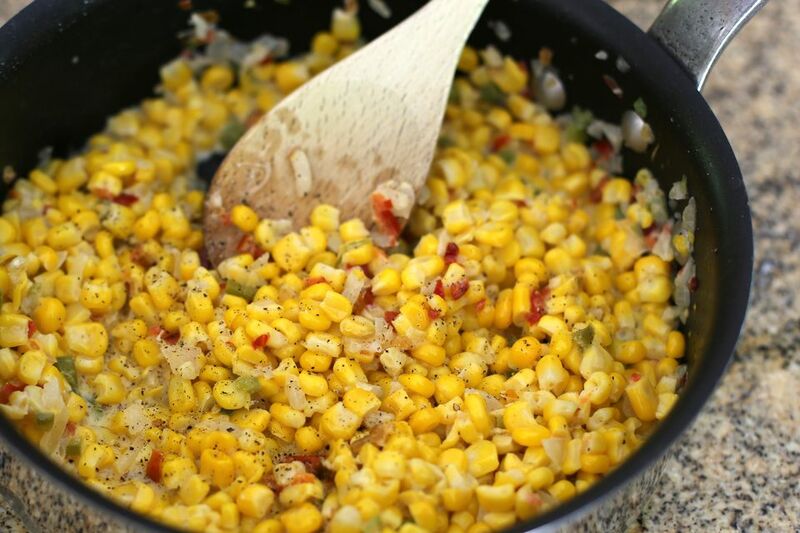 This easy corn recipe is made with fresh or frozen corn kernels, red bell peppers, green bell peppers, onions, and other seasonings. If you like a little more heat, feel free to add fresh mild or hot chile peppers to the skillet along with the bell peppers and onions. Or add a dash of cayenne pepper when you add the corn. This makes a tasty side dish, and it's an excellent recipe to use with fresh corn. See the tips and variations for a quick how-to for cutting fresh corn from the cobs. In a large skillet melt butter. Add red and green bell pepper and onion; sauté for 3 to 4 minutes, or until the onion is translucent. Add the fresh or frozen thawed corn kernels, salt, and ground black pepper. Cook, stirring, for 3 minutes; stir in fresh chopped parsley. Add a tablespoon or two of jalapeno pepper or another hot chile pepper to the skillet with the onion and bell peppers. Replace about half of the bell pepper with mild chile pepper, such as Anaheim. Remove the husks and silks from the corn cobs and rinse well. Slice off a bit of the tip end to create a flat top. Stand the corn in a wide bowl or pie plate on the flat end. With a y-peeler, sharp knife, or special corn cutting tool, cut the kernels from the cob. Cut about 3/4 of the way through the kernels, cutting a few rows at a time. After the corn has been cut, scrape the back of a knife over the rows to get any milky juices left on the cobs.